Hello, my name is Dr. Adam Thompson! 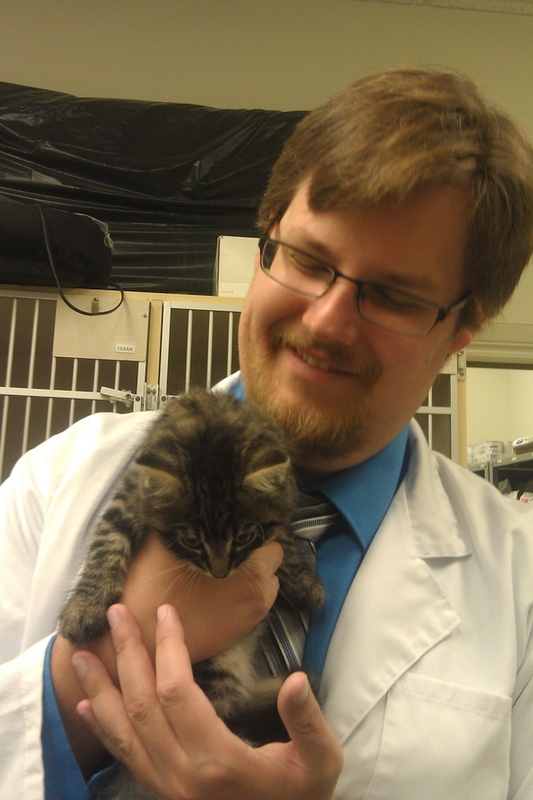 I graduated from the Ontario Veterinary College in 2011 and then worked at clinics in Sudbury and Durham Region before joining Dr. Rosely and the team in 2018. I have always loved just how many different things being a veterinarian allows me to do, even in a single day. It is exciting to be working with our patients and their human family at the clinic, researching complex medical conditions, and performing dental and soft tissue surgery. All of this means that our workday at the clinic is never routine, and there is always something interesting taking place. Being a veterinarian is a joy and a privilege, not only because of how wonderful working with animals can be but because of how much they can improve our lives. I lost my beautiful cat, Aurora, not too long ago, but getting to spend 18 years with her as my best friend was a gift, and she’ll always be my touchstone for how meaningful the human-animal bond can be. Away from work, I like spending time with my family, and with my lovely girlfriend, Fiona. I am an avid reader of all subject matter. I also enjoy travelling, and a relaxing afternoon hike on a nice wooded trail. I really look forward to meeting you and your pet in our clinic, and hope to see you soon!